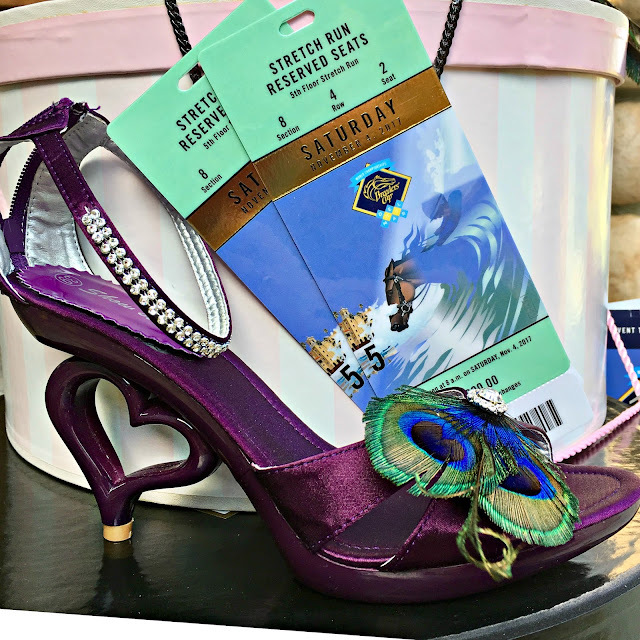 The Breeders' Cup was just over a week ago, but I'm still savoring a great weekend at Del Mar. Southern California really does have the perfect weather, and the setting was truly beautiful. It was easy to see how the track touts the slogan "where the turf meets the surf." It was also an honor to be selected as a finalist in the Longines' "Most Elegant Woman" contest on both Friday and Saturday. The iconic Swiss watchmaker sponsors racing and equine events all over the world, and usually invites celebrity representatives to help select "best dressed" winners at such events. "Most Elegant Woman" celebrity judge Carson Kressley was both gracious and funny. 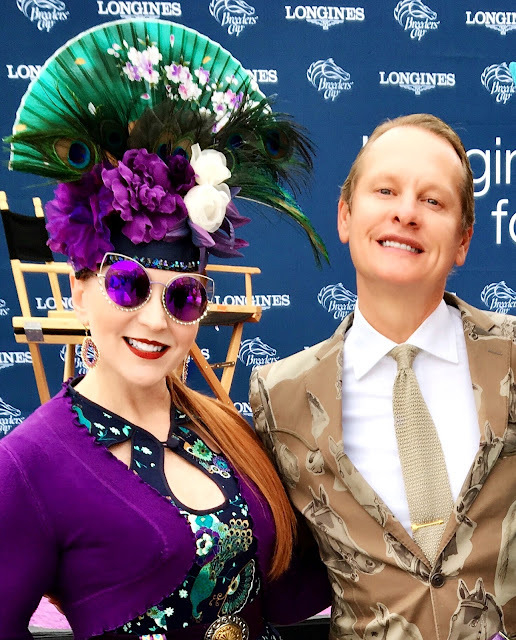 This year's Longines' celebrity judges included reality star and style guru Carson Kressley and "10" superstar Bo Derek. It was great fun to meet both of them, and chatting about fashion with Carson was a hoot. The man has a great sense of humor! 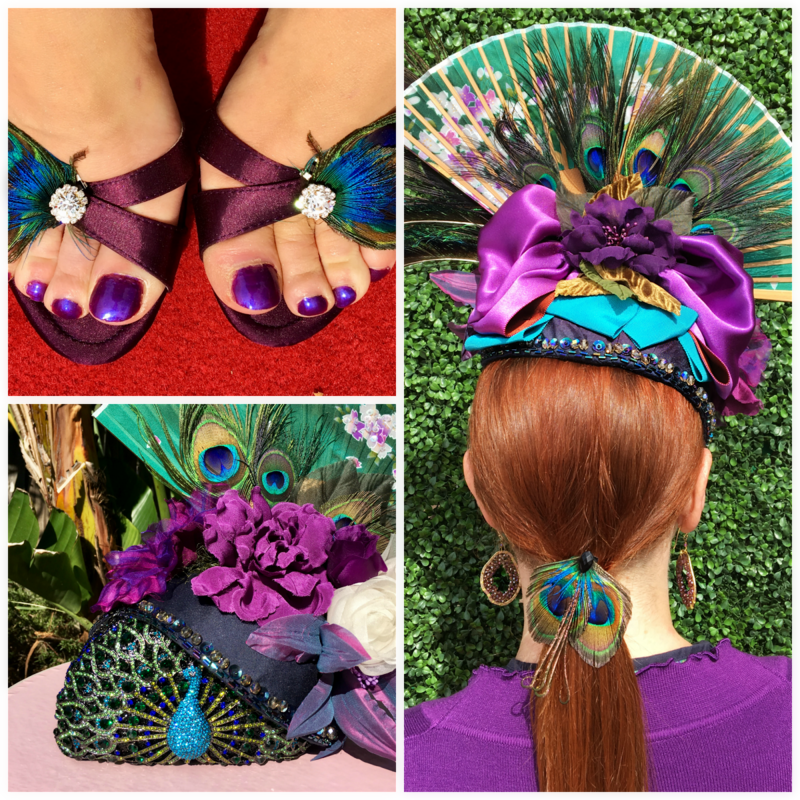 The shoes are from Amazon; I added the peacock feather clips to coordinate with the rest of my ensemble. My ensemble for Friday started with the dress. 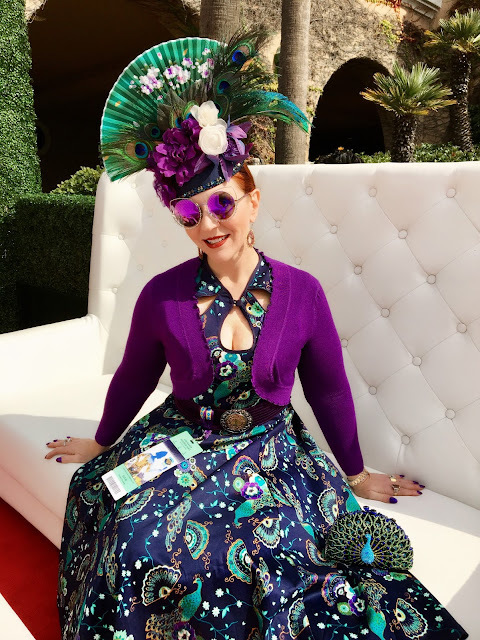 Sometimes it begins with the hat; and sometimes with the shoes, but this time it was a Banned Apparel peacock and fan print dress I found last year on clearance at Unique Vintage. 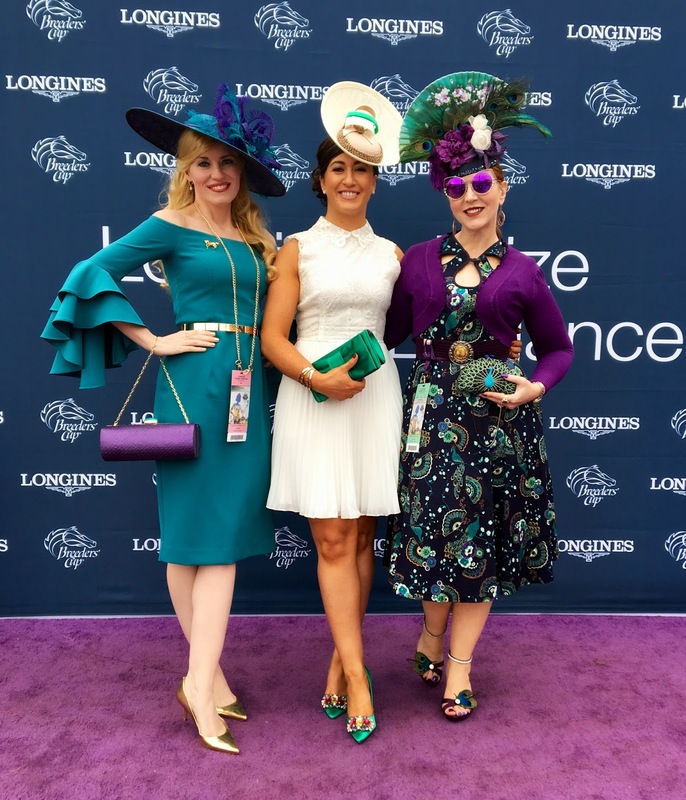 My stylish friends Eva (left) and Sharon (middle) were also finalists in the Longines' Most Elegant Woman contest. I didn't buy it with the intention of wearing it to the races. Yet, when I saw a photograph of a "fan hat" created by New York milliner Abigail Aldridge, inspiration struck. 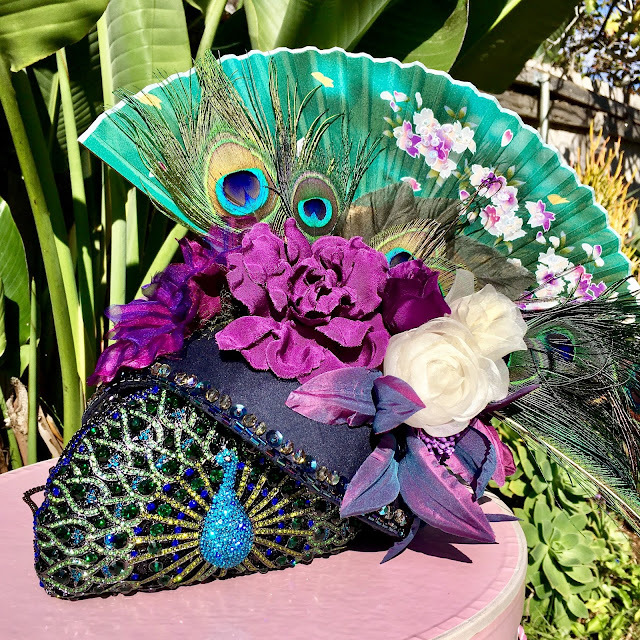 I scoured the web for the perfect folding cloth fan to complement the fan pattern in the dress, ultimately finding that "just right" piece on Etsy. I wouldn't typically go with purple nails and toes, but it the official color of the Breeders Cup, after all; I always like to make sure my hats look good from the back, too, since people are staring at the back of your head in the stands all day. Once I had the fan, I worked with Abigail to bring my millinery vision to life. It was so much fun to collaborate with her. She was also a dream to work with, even though she was in NYC and I was in Indiana. We exchanged many late night emails and lots of photographs along the way, but it really paid off because I could not be happier with how her creation completed my Breeders' Cup Day 1 look. You'd think Eva and I coordinated our looks with each other in advance, but it was total coincidence that we matched both each other and the Del Mar art installations. 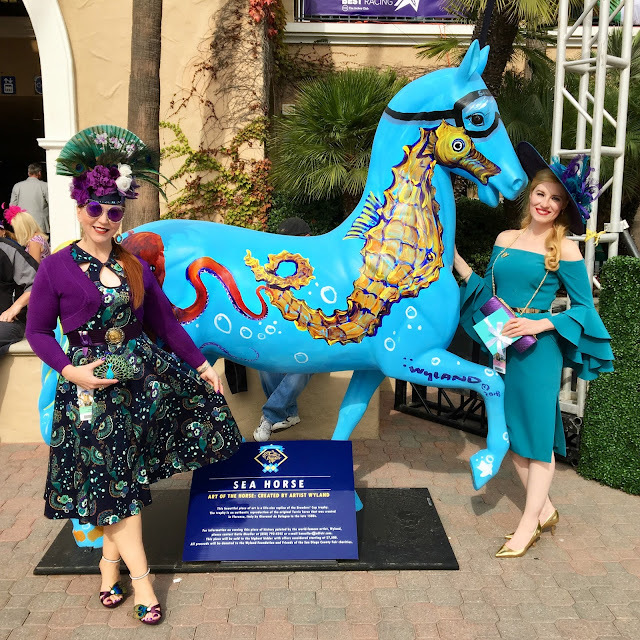 Beyond the ideal weather; stellar racing; and fun fashion, however, the best part of the Breeders' Cup, for me, was making new friends. 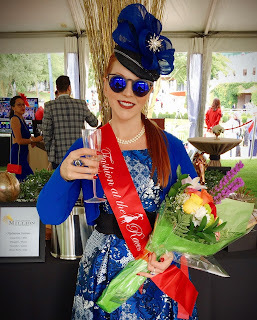 I met the beautiful Chicago native Eva Irena, pictured above, at the Arlington Million in August. We connected immediately over a shared love of chapeaus, but last weekend gave us a great opportunity to make some great memories (and plan some future adventures). KDef brought his own style game with a purple seersucker suit. 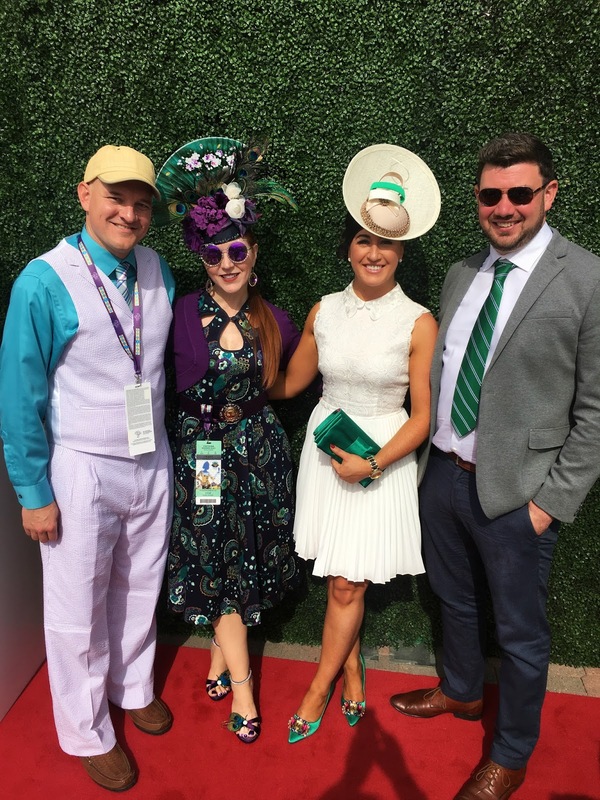 We also met up with a fantastic couple from Ireland in town for the races. 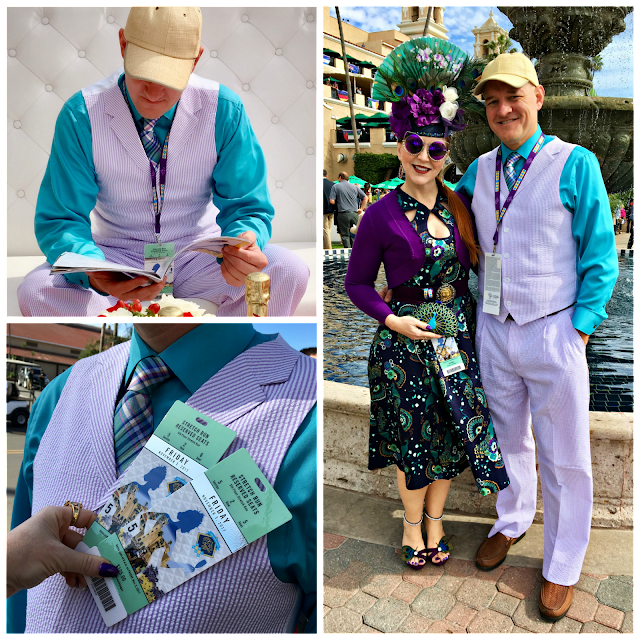 They are planning another trip across the pond in May for the Kentucky Derby, so hopefully we'll reconnect at Churchill Downs. Once again, it was a mutual appreciation of racing fashion that paved the way for an introduction...I can't say it enough: great hats bring people together! We toasted early and often with Irish couple Sharon and Tom in the G.H.Mumm champagne garden. Of course, a well-coordinated ensemble may lead to an initial conversation, but the substance and style beneath are what make the (wo)man. The Longines' slogan "Elegance is an Attitude" fits our new friends perfectly! Peacock anything is my favorite. You look AMAZING as always. 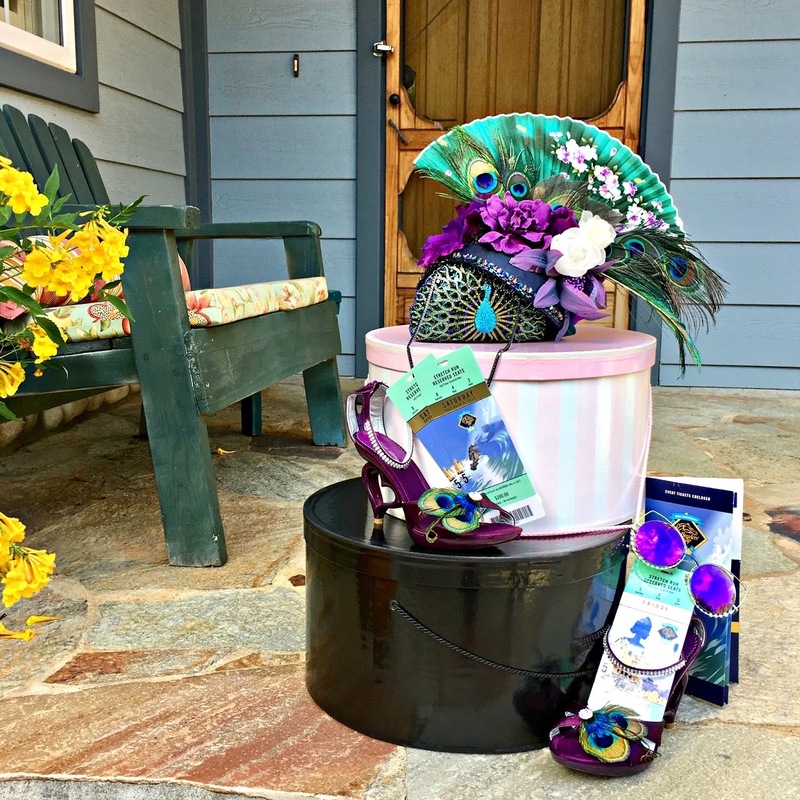 When my closet grows up, I want it to look exactly like yours! !